Kusozu: the death of a noble lady and the decay of her body, panel 6 of 9. Decomposition continues with the help of scavengers. 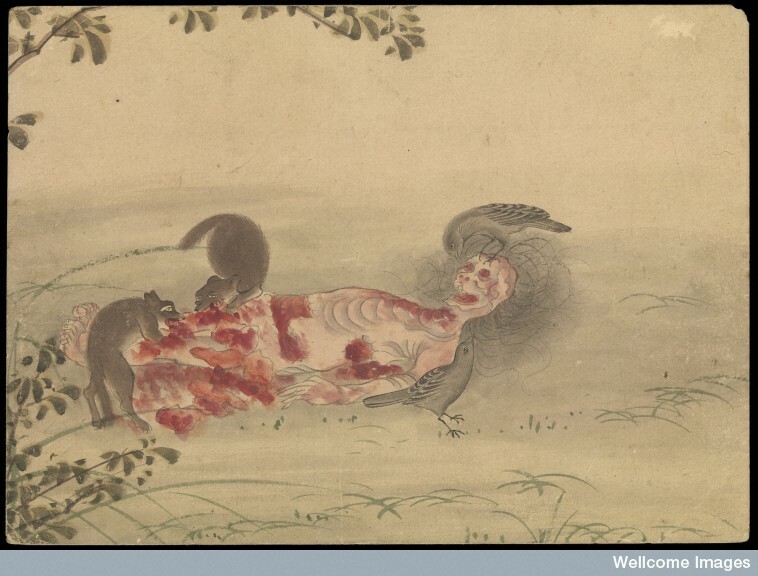 According to the Wellcome Collection, Kusozu: the death of a noble lady and the decay of her body was painted some time in the 18th century. The below scenes include: (1) the woman’s impending death and her preparation for it; (2) the noble woman has just passed away and her loved ones are seated around her; (3) slight skin discoloration (maybe some liver mortis) and a bit of bloating of during early decomposition; (4) the onset of putrefaction with bloating and marbling; (5) advanced decomposition as seen by pervasive marbling, leakage of purge fluid from the mouth, and the abdominal cavity has burst open (6) caving of abdominal cavity and scavenging animals; (7) start of skeletonization and the disappearance of soft tissue; (8) complete skeletonization and scattering of remains; (9) finally human remains have been completely scattered or consumed by unseen animals so all that remains is a memorial for the deceased woman. Kusozu: the death of a noble lady and the decay of her body, panel 3 of 9. Kusozu: the death of a noble lady and the decay of her body, panel 5 of 9. Kusozu: the death of a noble lady and the decay of her body, panel 7 of 9. Kusozu: the death of a noble lady and the decay of her body, panel 9 of 9. I had no idea these existed. Thank you for posting these, they are beautiful and macabre. Great post. I appreciate the reminder of each stage of death being as temporary and fleeting as each stage of life. These are fascinating, and I had not heard of them before. The contrast between the beauty of the painting and the highly stylized, but still unsettling depiction, of decomposition is truly compelling. These are amazing! Hadn’t heard of them before, but I may be a little obsessed now, too! I don’t know if it’s the watercolors, the subject, or a combination of the two but the progression is mesmerizing without being exploitive. Actually, in Buddhist tradition, there is a form of meditation on transience of the body. This meditation is to remind the monks that this body, however noble by birth, or beautiful in physical form, is highly temporary and that all attachment to this body should be abandoned to experience peace and tranquility. Monks usually meditate upon skulls and rotting corpses for this purpose. The decay, stink and all its associated unpleasantness are items to meditate upon. These water colour pictures replace actual corpses, but the purpose is the same. Meditate on death and the passing away of this body which we seem to be very much proud of, attached to and we spend all days and years trying to serve it, while forgetting the impeding death and the impermanence of life. Thank you for your explanation and pointing a finer point on the discussion. I hope you don’t mind me reposting your beautiful explanation. Reblogged this on THE MUSEUM SHED. Meditating on the stages of decomposition by viewing an actual corpse is a very old Theravada Buddhist practice. Very interesting to know that it was practiced beyond Southeast Asia. I knew about the Aghouri but didn’t realize that a similar practice was observed in Japan. But I guess what really surprised me was the crazy accurate documentation of the decomposition process. Meditating on the decay of the body is also practiced in the Mahayana tradition, not just (exclusively) by Theravada. Example: Sky burial/ the feeding of body parts to vultures in Tibet and India. Thanks, I enjoyed this! I like that this process was good enough for a noble lady, and I also wonder if there was anything different done for non-noble ladies. I, too, am obsessed with kusozu, Japanese watercolor paintings that graphically depict human decomposition. I had no idea something could be so beautiful and unsettling at the same time. It’s like you want to look away but can’t.